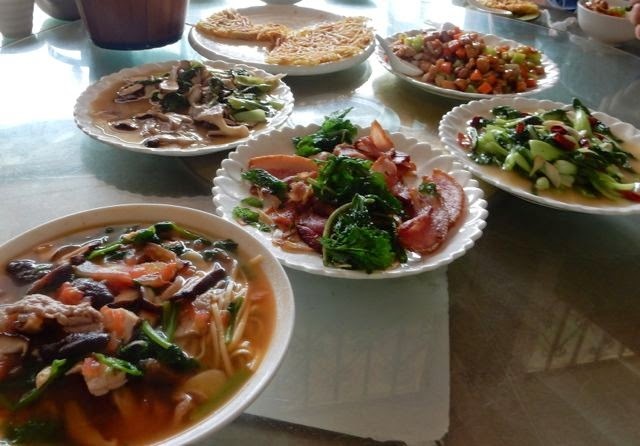 Leaving Shangri-la is not easy - the cool mountain air, the peace, the fascinating Tibetan culture and architecture, the gold topped monasteries overlooking life from its mountain side perch, and good hotpot dinners. A rough day was on tap after early breakfast. Let me say one thing about breakfast in China - every hotel, no matter how small or big lays out a feast for breakfast unlike anything in my travels - salads, all sorts of beef, bacon, hams, Tibetan favorites, Japanese sushi and miso soups, Chinese spicy meals with noodles, beans, fried rices and lots of condiments, attempts at Western style breads, including donuts and French fancy stuff, desserts in tiny tiny glass jars or cups, pancakes, waffles, omelettes, fruit juices in glass pitchers, various coffees and teas (try chrysanthemum, snow mountain, crabapple, rose or fresh ginger tea) - and its included in the room fee. Our task to day was to reach the Tiger Leap Gorge about two hours a way. I’m not much on the arduous challenge of crossing mountains 11,000 feet and then dropping down in a whirl of curves to 2000 feet on two lane cliff-hangers, broken up now and then by fancy new tunnels constructed by the new Chinese powers that be. It would take two hours to go about 50 miles. Sigh. 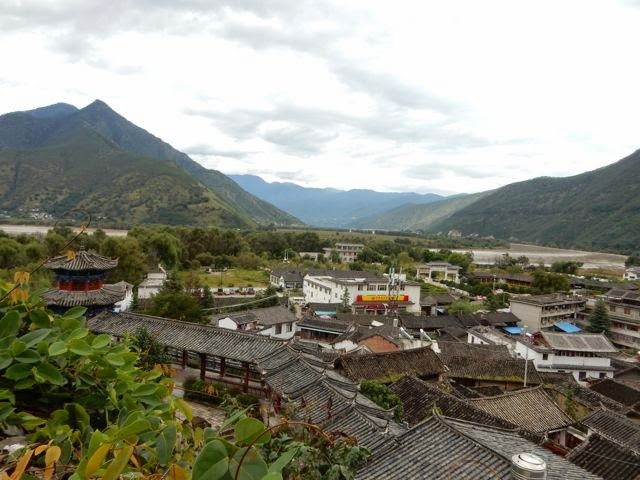 The mountains are close together with narrow valleys and the brown Yangzee River running through them. A few small villages cling to the mountainsides to provide living quarters for those working in the silver and copper mines and the enormous hydro-electric complexes. 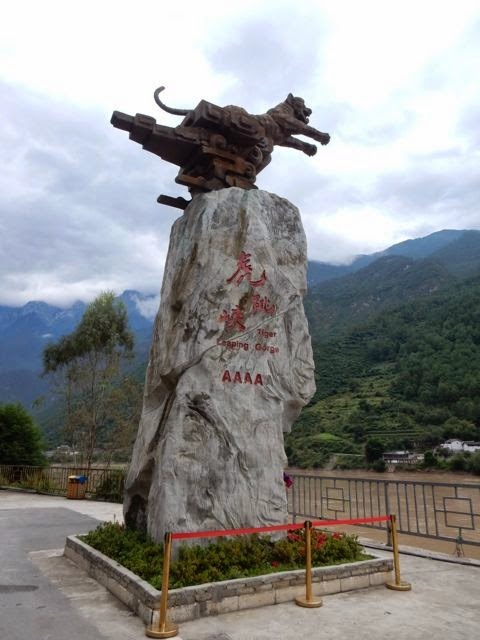 There is, of course, a monument with a tiger leaping, and a legend about two angry tigers fighting and one got away by leaping across the narrow gorge. When we finally reach the gorge, I had to admit it was impressive. 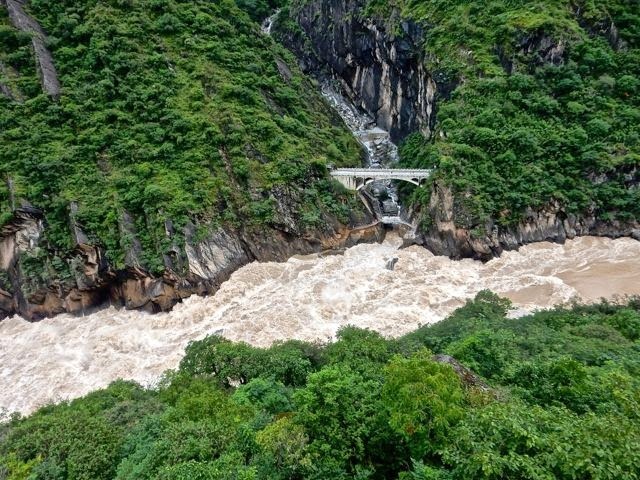 Jim, who has traversed most mountains and valleys in Asia and other places, stated it was the most impressive rapids he had ever seen. Any boat trying to pass through would become mush. 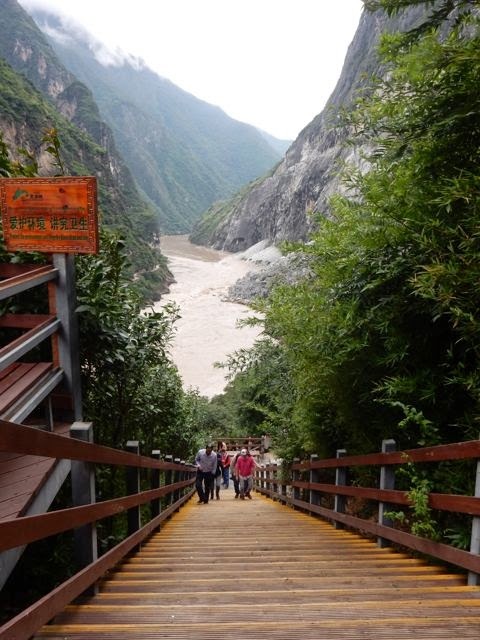 And the government has built an appealing, multi-leveled overlook to accommodate the thousands of Chinese tourist who visit and take selfies in front of the rapids, but, holy hannah, you must tackle 1500 steps from where the buses drop you off to get a close encounter with the rapids. That’s one-way down. Up again is the second part. There are men willing to take you in a sedan chair that look more scary than the rapid, so I declined to tackle it at this altitude and after taking photos, rested in the van while Jim took the climb down and up. Of course, having come out this far, we had to go back that far, but we stopped in a village (only as wide as the road) to have a really honest Chinese on the spot meal. 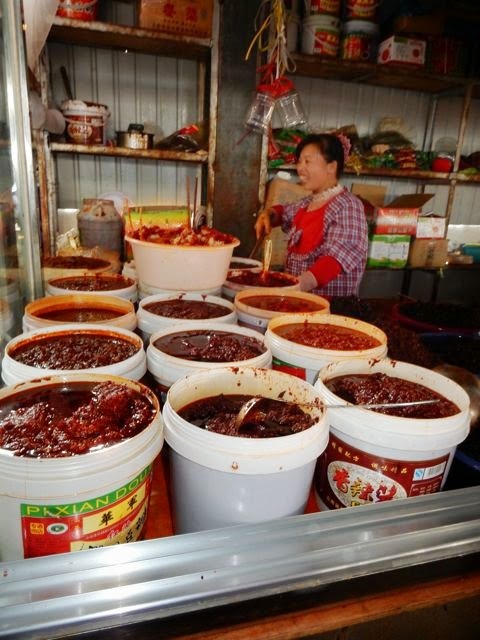 This usually means spicy pork fried in a wok with string-beans, bell peppers, carrots, lotus root, pea pods, a mountain of garlic, onion, celery, and soups and pickled cucumbers and four or five more plates of wok stuff. Dumplings for me. (The spiel about me is: vegetarian, no hot spicy, no rice or noodle, no tofu - breast cancer no-no - and no fish with bones). Am I picky? But there are so many fresh vegetables familiar with a wok that one never starves. 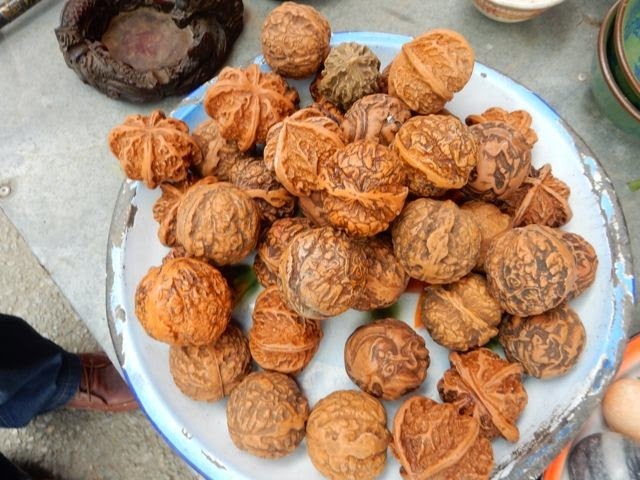 Fried string potatoes were edible. Mushrooms fascinating as this is mushroom country. Now as to sweets, there’s a problem on the road. If you are lucky, you can find an ice cream freezer in some shop and it will have somewhat of a selection of wrapped cones and bars. I’ve tried taro root ice cream and this day it was corn ice cream. Not bad. After saying goodbye to Mima, our handsome Tibetan guide who taught me so much about Buddhism, and who shared the karma moment with the Little Buddha, whom he had never seen, we headed for Shigu, a small town in corn and tobacco country, once a bed for poppies until Mao wiped that out, and famous for it being on the corner of the first bend in the Yangzee River, the point where the Yangzee stops flowing south and starts flowing north-east so it never leaves China, though other rivers go on down to other countries to get out to sea. Here we met a favorite guide, Holly, who immediately got us enthusiastic about this spot. A stroll through country markets always gets me enthused because I see such unique things - like woven bamboo footstools or low sitting stools with bright colored fabric tops, and rolling stones - take two and put in hand and try rolling then around - this is not as easy as you think, but is darn healthy for arthritic hands - and if you prefer, you can get two balls the size of walnuts carved from bone to look like walnuts, used for the same thing. had helped to removed Japan from China, with many atrocities in that story. 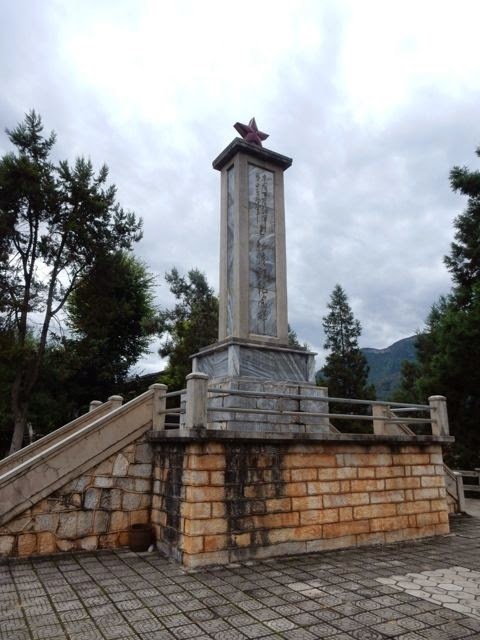 But the Communists set up their base in Nanjing, and the Nationalists (Chiang-kai-shek) defeated them and put them on the run. This began the long march (on foot) that took five years, but gaining strength as they marched through the countryside, and people joined their five armies, basically hoofing it all over China. 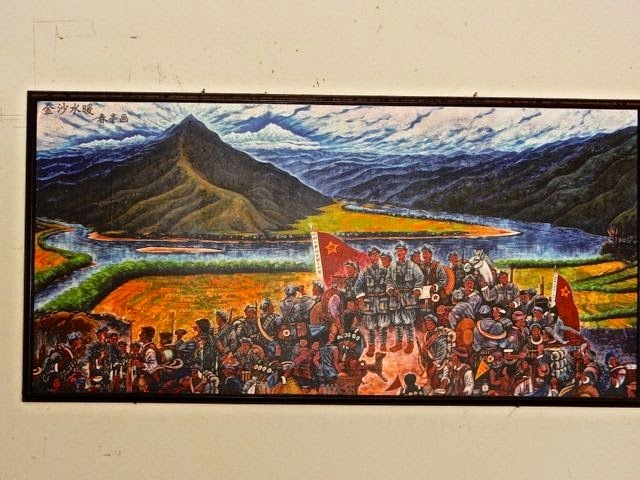 So one army reached Shigu, crossed the Yangzee so arrived in Tibet and regrouped in Shizhuan, and they defeated the Nationalist army which got pushed into Taiwan, abandoning China and taking with them all the gold, art and treasures they could. One scam was the Nationalist had enticed the people to put all their gold in the bank and receive one copper coin which they could redeem for their gold back again. But it was a farce. And the Defense Minister of the Nationalist, once fled, became one of the wealthiest men in the world in those days. So, we climbed up to see the monument - one a concrete tower with a red star on top, and the other a statue of a Red army and a boatman on the river. 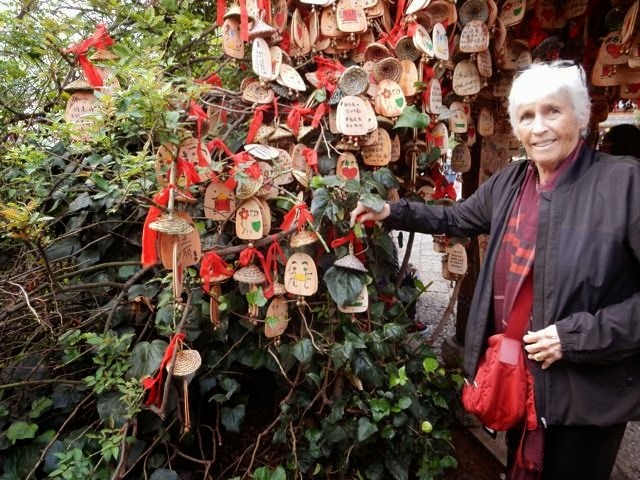 There is a mini-museum which has some history there if you can read Chinese. 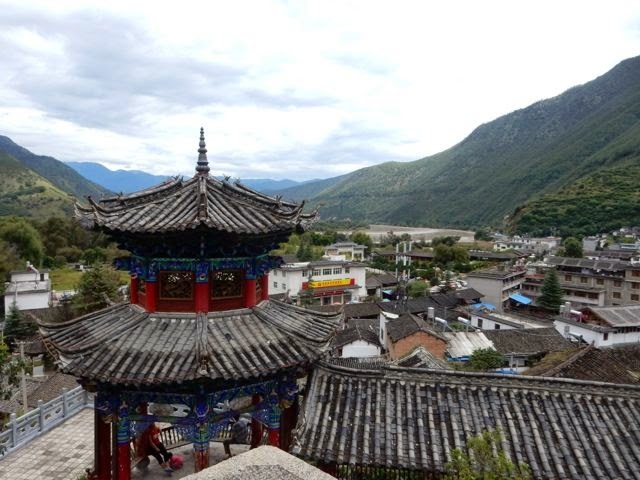 From the viewpoint, you could look out over the tiled roofs which reflect history at the bend in the thick river and there is also a legend about a stone drum. Another hour on the road and we arrived at what became one of the best cities on our China safari. 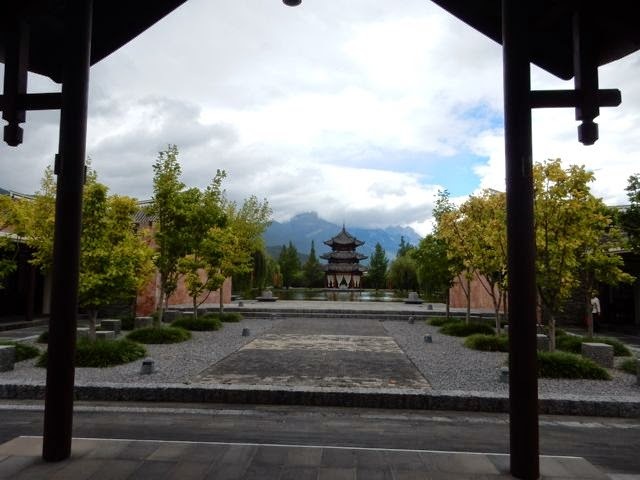 Lijiang in the Yunnan Province. Although it has grown by leaps and bounds, its center is still full of old town character and this is a popular place with Chinese tourist. 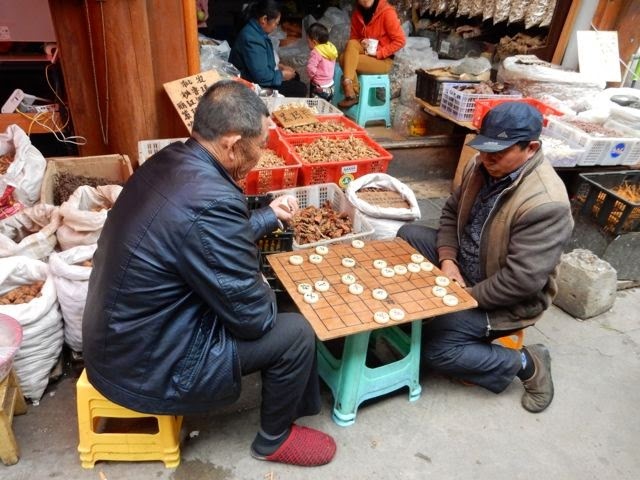 The population is 100,000 in the town, but they get 14 million visitors a year, 95 per cent Chinese. It breaths of stylish young people mixed with minorities in their tribal dress. And their Old Town is one of the most fun, though cobblestoned, areas to walk and browse through. 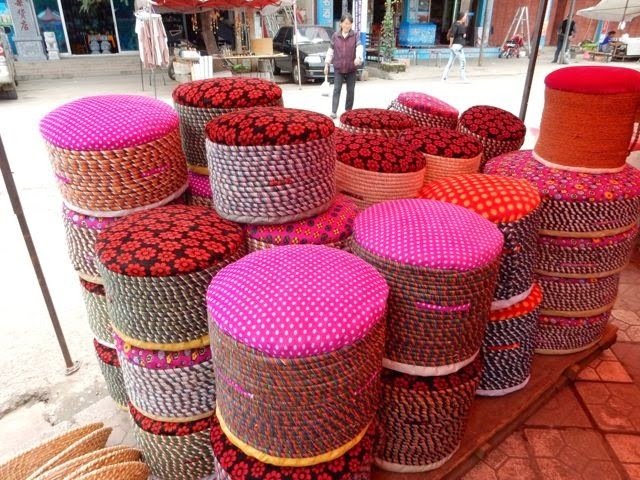 The primary minority group here in Lijiang is Naxi (Nashi) and there are the Bi, the Yi, the Pumi and the Yao, whose women embroidered and needlepointed coded messages on their clothing to communicate with other women without anyone knowing what was being said. Our guide is a Naxi. another skyscraper or group of vacation homes. China puts all its people to work. Poverty is not evident. Homeless don’t roam the streets and crime is under pretty good control. People seem to thrive, have a happy and positive attitude, and have great hope to reach their goals. It’s a pleasant atmosphere. Your blogs are fabulous. Your writings tell an amazing story and make us feel like we're sharing your adventure with you. 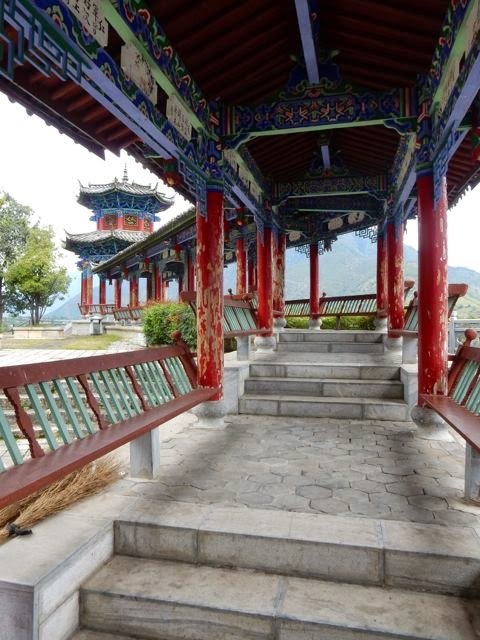 The word pictures you've created and the photos you sent show the magnificent beauty of China. Every meal and especially the breakfast you described sounds like a feast. The Chinese must eat a lot, but you don't see many of them who are overweight. Wonder why? We would really enjoy their breakfast, but we'll pass on the weird ice creams. We understand the desire to have population control, but we believe the system they have developed is unfair. It is an opportunity for favoritism for whatever reason. Also, there is an opportunity that payoffs could corrupt the system. Fall is here. Temperatures have dropped and is very pleasant. Be safe! God bless you!